« They pre-empted a football game for an Obama talk on guns at a memorial service? Are they are reals? Subscribe to comments with RSS or TrackBack to 'In defence of the now ‘truly independent’ independent councillor Dr. Vel'. Cllr Terry’s grouo now has ten members, whereas the Liberal Democrats have nine. 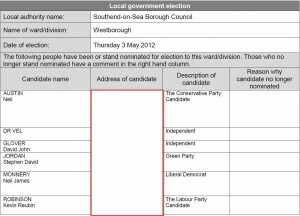 Actually, Cllr Dr Velmurugan is guilty of misleading the voters in Westborough. Whilst you mention the ballot paper you ignore his campaign literature and post-election newspaper advertisements. These have left many in his ward feeling they have been hoodwinked. That would be a valid point (the hoodwinked) if it wasn’t coming from Cllr. Terry. As he always says ‘the independents are truly independent (even when they are not)’ so for him to attack Dr. Vel at this point is not a valid excuse. Now had he attacked him for essentially being a Tory wearing independents clothing then that would have some credence but that isn’t where his attack is coming from. Thank you. Thank God for giving us men with true ,honesty,true integrity and impartiality like you,Sir, That is why people like me can exist,survive and may try to make a mark in the society. You are a visionary,proved by me that still I am the the only independent councillor among the 51. Party affiliated councillors.